This personalized ornament is a must-have for enthusiasts of the hit ITV/PBS show about the Crawley family and their servants in post-Edwardian England! 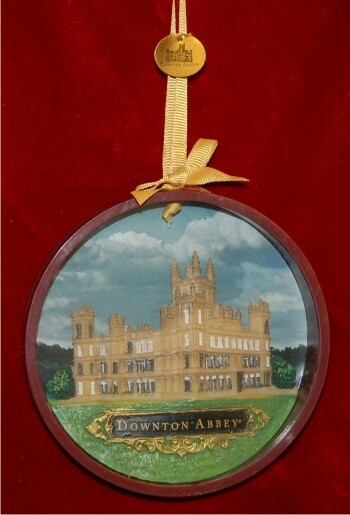 The Downton Abbey personalized Christmas ornament brilliantly captures the family home and grounds in a disc ornament that can be personalized on the reverse side to make it one of a kind. We hand letter the information in an attractive font befitting this elegant Downton Abbey ornament. Surprise any fan of the show with a personalized Christmas ornament they’ll really enjoy, a TV show ornament gift that includes our plush velvet gift pouch, ideal for storing the ornament too.